Miss Armstrong was feeling especially frustrated by the attitudes of her fourth grade class. She felt that they simply thought they were too dumb to learn. SO she thought she would try something different. As she stood at the front of the class, she asked for everyone who thought they were dumb to simply stand up. There was an awkward pause for several moments, and finally little Johnny stood up. Miss Armstrong asked him if he thought he was dumb. None of us would admit we are dumb, but most of us would admit we are sinners. That’s because we are bothered by our sins. They seem to be ever before us. 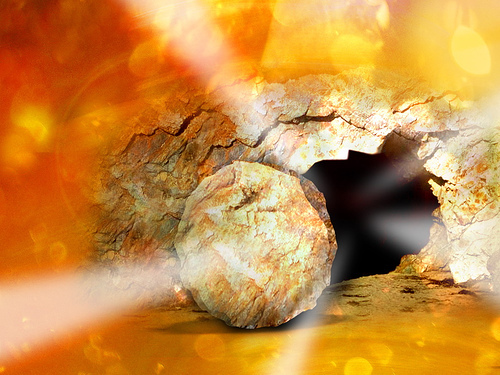 In Romans 3:21-26 and we saw how Jesus Christ revealed the righteousness of God to mankind. 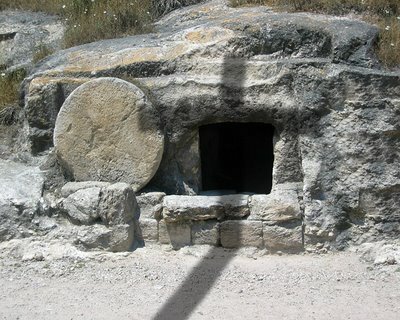 He not only revealed it, he made it available as a free gift to all who believe in Him. 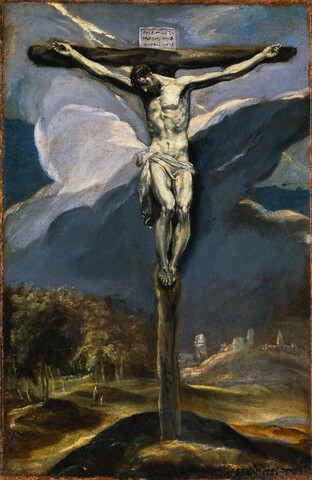 He did so by three distinct but interconnected things: Jesus was our Propitiation, He is our Redeemer, and as a result, God is our Justifier. Justify means that God did not merely ignore our sins, He declares we are Righteous, like Him, as if we had never sinned. 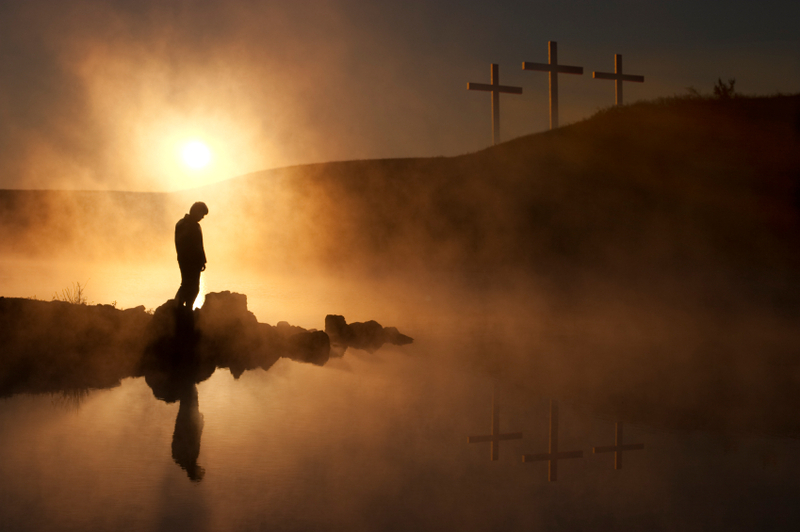 In order for God to be able to justify us, something had to be done with our sins. Romans 1-5:11 explore all that God has done to deal with our sins. Romans 5:13-8:37 explores how God deals with our sin nature. It is because in the first section of Romans, it is a question of the sins I have committed before God, which are many and can be enumerated, whereas in the second it is a question of sin as a principle working in me. 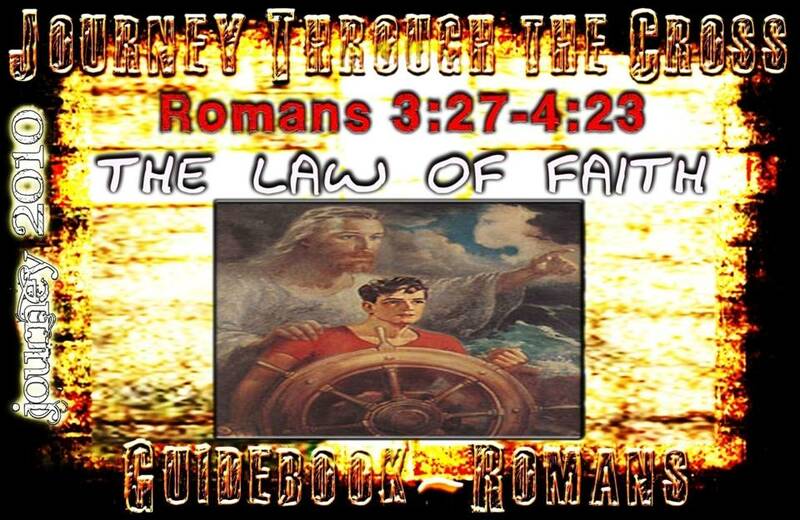 The first 4 1/2 chapters of Romans deal with our sins and the Salvation we have in Christ. The next 3 1/2 chapters deal with the Law of Sin and how we have Sanctification through Christ. No matter how many sins I commit, it is always the one sin principle that leads to them. I need forgiveness for my sins, but I need also deliverance from the power of sin. Sins touch my conscience, the principle of sin affects my living. I may receive forgiveness for all my sins, but because of my propensity to sin, I still have no peace of mind. When the light of God’s Word first shone into my heart, my cry was for forgiveness, for I realized I had committed sins before Him. Once I have been forgiven and born again I make a new discovery, the discovery of a principle or law of sin that drives me to keep sinning, even though I am a new creation. I realize there is something wrong within me. I have an inward inclination to sin, to put myself first, to lean on my own understanding. I still have this nature that desires to sin. I may seek and receive forgiveness, but then I sin once more. So life goes on in a vicious circle of sinning and being forgiven and then sinning again. I appreciate the blessed fact of God’s forgiveness, but I want something more than that: I want deliverance. I need forgiveness for what I have done, but I need also deliverance from what I am. The next few weeks we will discover together the means of deliverance, but today we must lay the foundation for that deliverance, and then continue the foundation next week. We need to wrap our hearts around the significance of two things which are found prominently in Romans 4 and 5. The most important truth we must learn this morning is the truth about the Blood of Jesus Christ. Romans 3:25-26 (KJV) Whom God hath set forth to be a propitiation through faith in his blood, to declare his righteousness for the remission of sins that are past, through the forbearance of God; To declare, I say, at this time his righteousness: that he might be just, and the justifier of him which believeth in Jesus. Romans 3:25-26 (Phillips NT) God has appointed him as the means of propitiation, a propitiation accomplished by the shedding of his blood, to be received and made effective in ourselves by faith. God has done this to demonstrate his righteousness both by the wiping out of the sins of the past (the time when he withheld his hand), and by showing in the present time that he is a just God and that he justifies every man who has faith in Jesus Christ. Just= díkaios; fem. dikaía, neut. díkaion, adj. from díkē right, just. Righteous, just. Used in the neut. tó díkaion, that which is right, conformable to right, pertaining to right, that which is just.CWSD. Justifier= dikaióō in the act. voice means to recognize, to set forth as righteous, to declare righteous, to justify as a judicial act. Only God can justify a sinful man. Only God can declare we are righteous. And the Blood of Jesus allows Him to do just that! But how often do we try to justify ourselves? This is clear from Luke 10:25 in which a lawyer who came to Jesus asked Him how he could inherit eternal life. 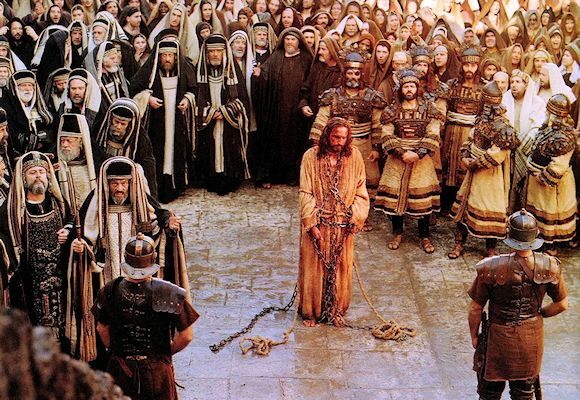 “Willing to justify himself” (But he, desiring to justify himself, said to Jesus, “And who is my neighbor?”( Luke 10:29) The Pharisees to whom the Lord said in Luke 16:15, “Ye are they which justify yourselves before men,” i.e., you have set yourselves forth as righteous, as if there is nothing wrong with you if you were to stand in a court of justice. No matter what efforts you take to try to justify yourself, God says it is not enough. Only just God has the power to declare you righteous. And only the Blood of Jesus has the Power to allow Righteous God to declare us righteous. ‘There is none righteous, no, not one; there is none who understands; there is none who seeks after God. They have all gone out of the way; they have together become unprofitable; there is none who does good, no, not one’ (Psalms 14:1-3; 53:1-3; Ecclesiastes 7:20). ‘whose mouth is full of cursing and bitterness’ (Psalm 10:7). ‘Their feet are swift to shed blood; destruction and misery are in their ways; and the way of peace they have not known’ (Isaiah 59:7,8). ‘There is no fear of God before their eyes’ (Psalm 36:1). 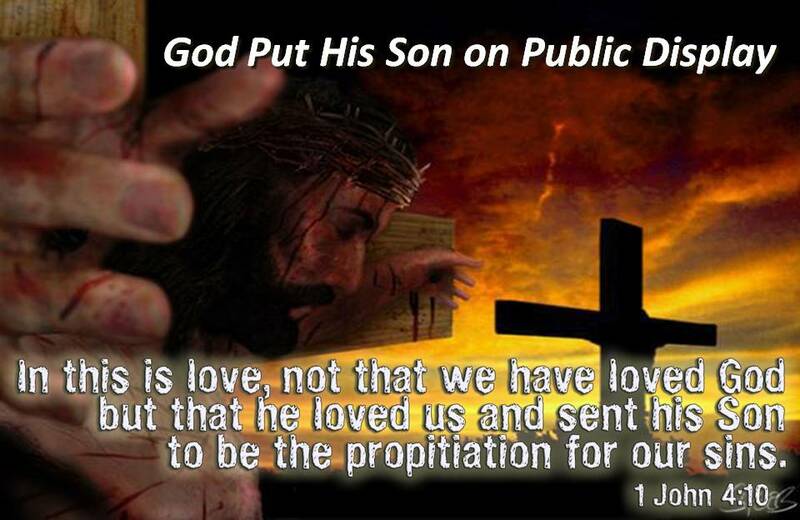 God is the One who “set forth” (proetheto) Christ to be the propitiation for man’s sins. God purposed to “set forth” Christ: God determined, resolved, ordained Christ to be the propitiation or the sacrifice for man’s sins. God set Christ “before” (pro) the world as the propitiation for the world’s sins. The pro in the Greek word proetheto indicates this fact. God set Christ before Satan. This setting forth revealed Christ as the propitiation for the sins of mankind, the propitiation that satisfied the righteousness of God, and rebuked the accusations of Satan. B. 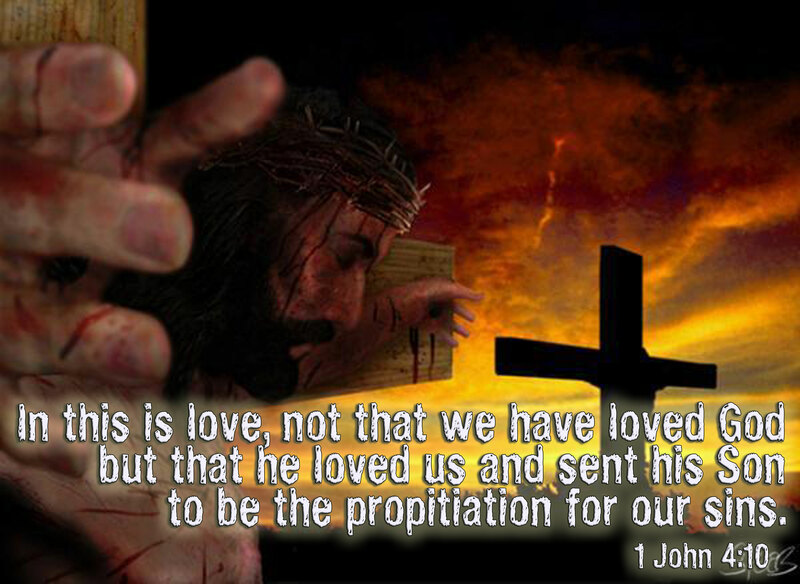 It is Christ Himself who is the propitiation for man’s sins. the sacrifice for our sins. the covering for our sins. the satisfaction for our sins. 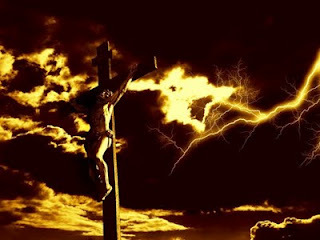 the payment for the penalty of our sins. the appeasement of His wrath against sin. 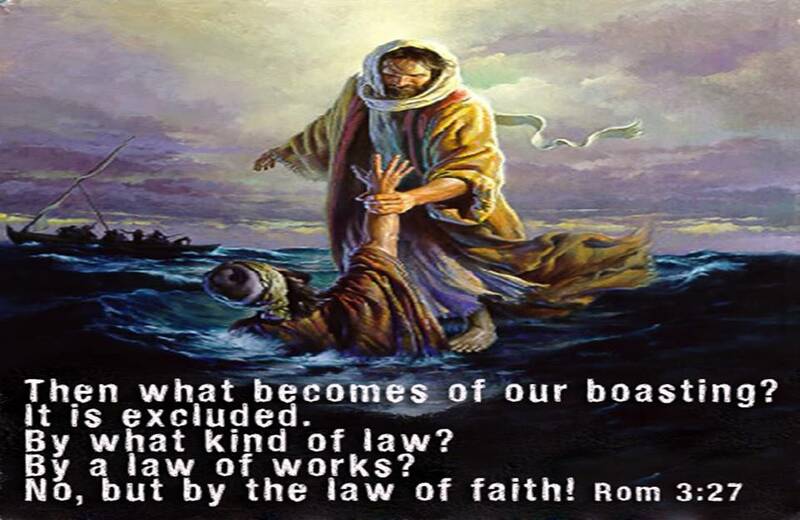 Romans 1-3 sets forth the sins of mankind, the lawlessness of mankind. 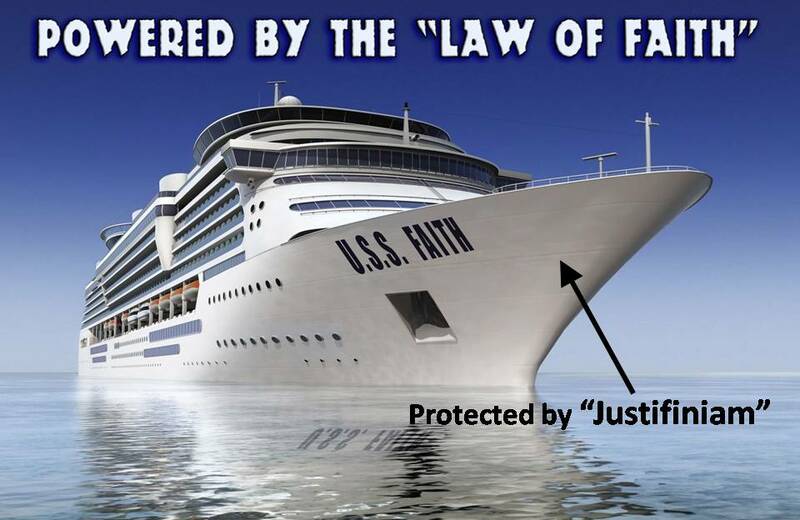 Mankind is bedeviled by the disease of lawlessness and sins. Not only is God’s wrath upon man because of his sins, but man’s conscience accuses him, and to top it off Satan himself is man’s accuser. 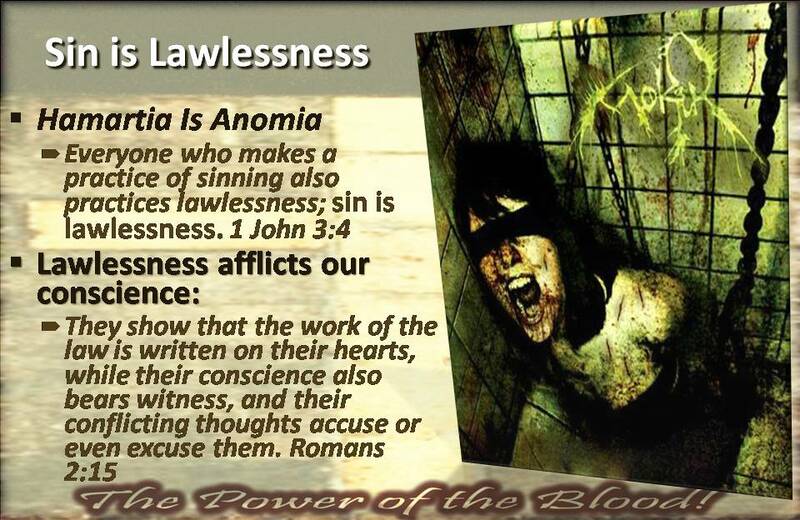 There is only one thing in this world powerful enough to deal with the sin and lawlessness that we are diseased with! The blood can only be powerful for us if it is powerful for God! A. 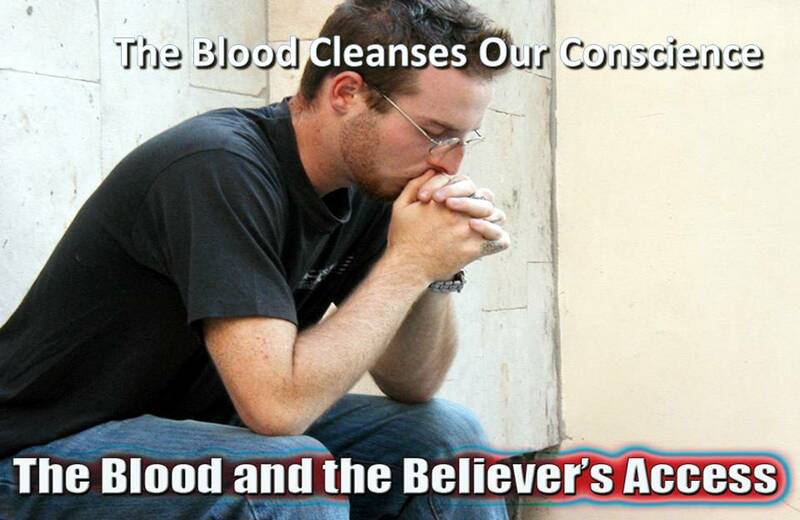 The Blood is for atonement – Deals with our standing before God. 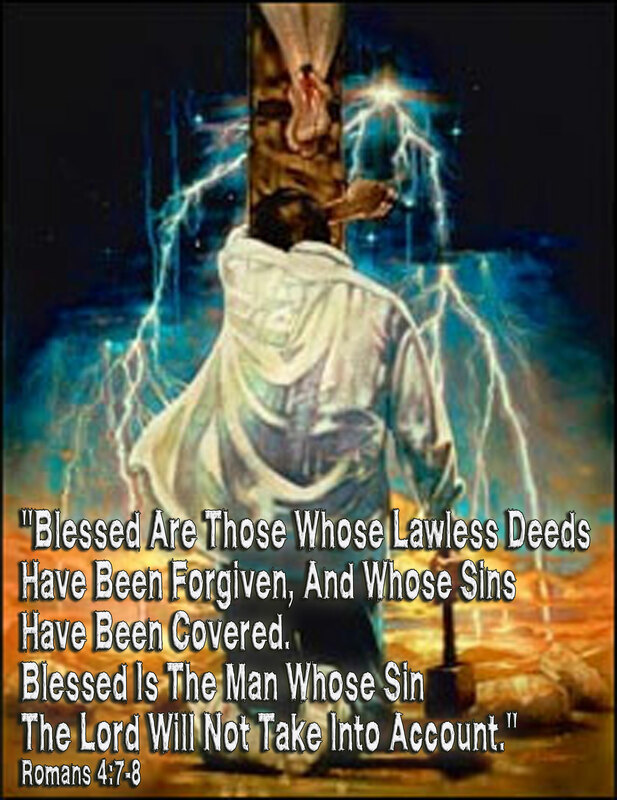 We need forgiveness for the sins we have committed,for the wrath of God hangs upon us because of our lawlessness. John 3:36 (ESV) Whoever believes in the Son has eternal life; whoever does not obey the Son shall not see life, but the wrath of God remains on him. We are forgiven, not because God overlooks what we have done but because He sees the Blood. What we need the Holy Spirit to reveal to us is how God sees the Blood of His Son. 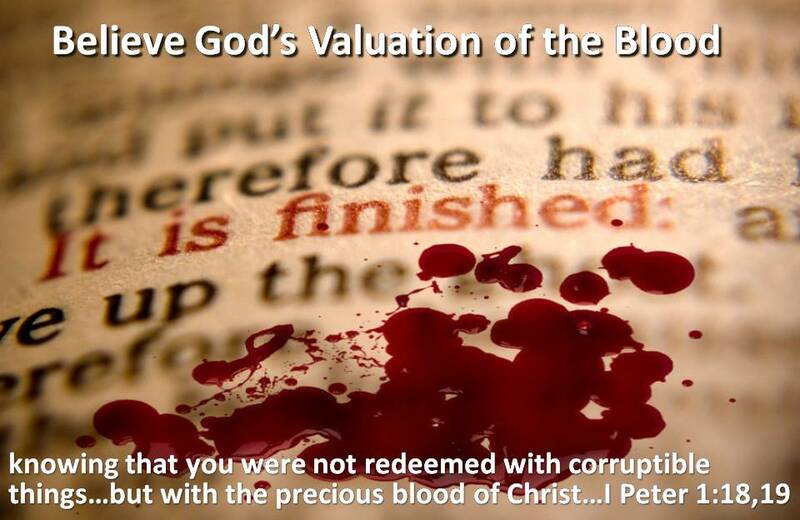 If I am to appreciate fully the value of the Blood of Christ, I must understand God’s valuation of it. 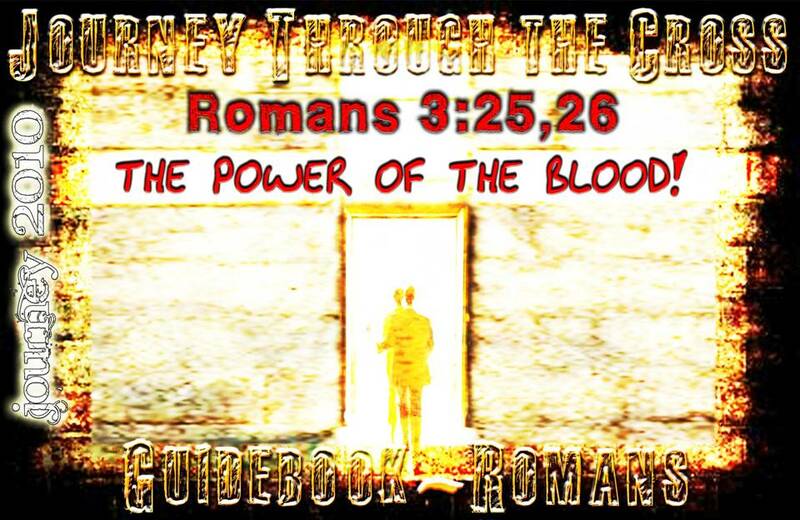 Throughout the Old and New Testaments the word ‘blood’ is used in connection with the idea of atonement, over a hundred times, and throughout it is for God. 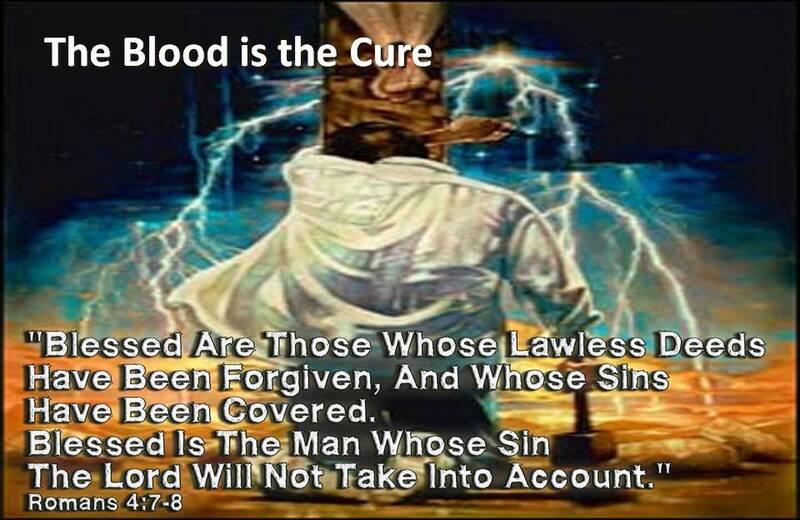 In Leviticus 16 we find that on the Day of Atonement the blood was taken from the sin offering and brought into the Most Holy Place and there sprinkled before the Lord seven times. On that day the sin offering was offered publicly in the court of the tabernacle. Everything was there in full view and could be seen by all. 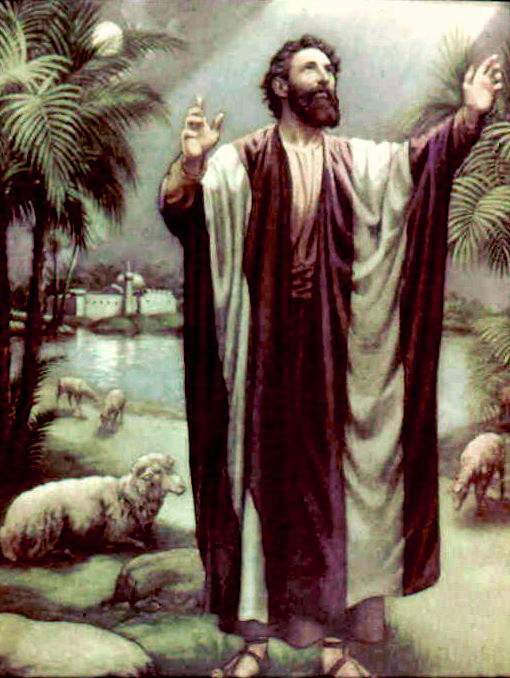 But the Lord commanded that no man should enter the tabernacle itself except the high priest. 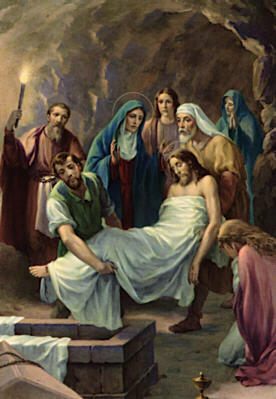 It was he alone who took the blood and, going into the Most Holy Place, sprinkled it there to make atonement before the Lord. The High Priest/Jesus was the one who did the work. None but he could even draw near to enter in. There the only thing the High Priest did was present the blood of the sacrifice to the unseen God. If God was satisfied with the sacrifice, the Priest lived. If not, he died. 2. 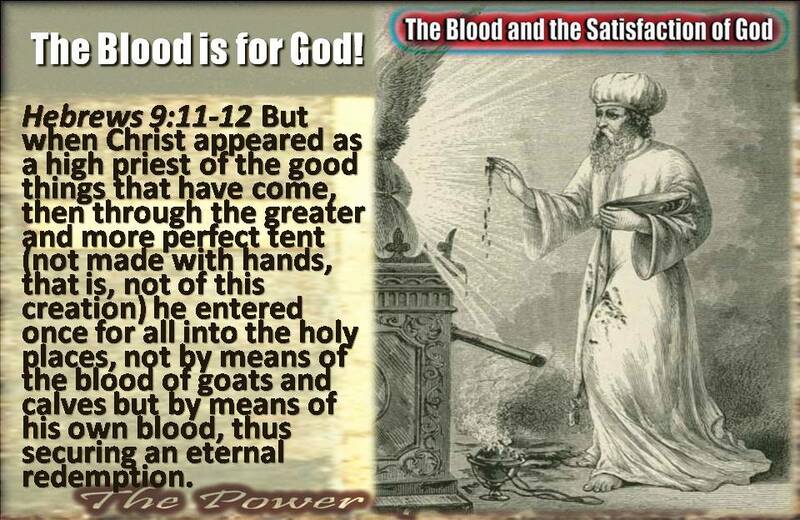 The Blood is therefore in the first place for God. It is God’s holiness, God’s righteousness, which demands that a sinless life should be given for man. The sacrifice had to come from that which met God’s strict demands. There is life in the Blood, and that Blood has to be poured out for me, for my sins. God is the One who requires it to be so. God is the One who demands that the Blood be presented, in order to satisfy His own righteousness, and it is He who says: ‘When I see the blood’, I will pass over you.’ The Blood of Christ wholly satisfies God. Once we are exposed to the Law of God, and grow in our knowledge of HIs Word, our awakened conscience may have become super sensitive, and this can constitute a real problem to us. The sense of sin and guilt can become so great, so terrible, as almost to cripple us by causing us to lose sight of the true effectiveness of the Blood. At times our sins are so real, and some particular sin may trouble us so many times, that we come to the point where to us our sins loom larger than the Blood of Christ. We try to feel forgiven! It does not work that way! 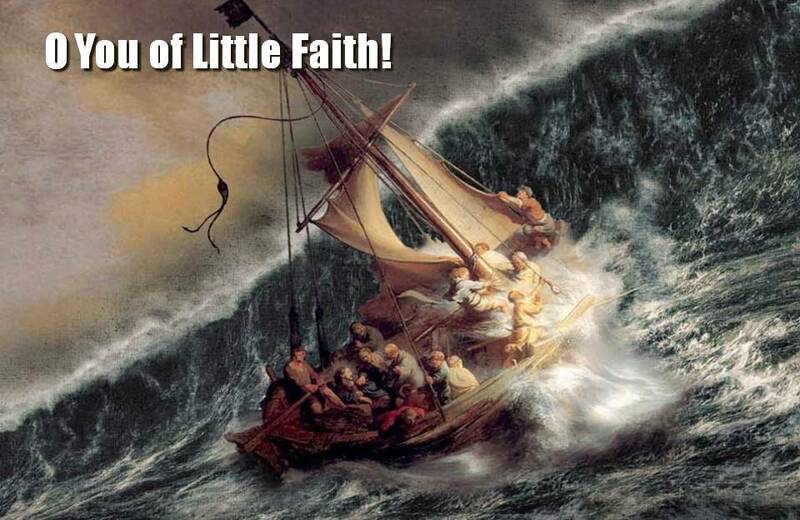 We must accept God’s valuation of the blood by faith! You can’t feel forgiven, you can’t cry yourself forgiven. 1. Have Faith in God’s Word. We have to believe that the Blood is precious to God because He says it is so! The Truth will set you free! Only as you learn to walk in the truth that the Blood means you are Righteous and Justified, will you be set free from the guilt of your sins! To God, the blood means we have been redeemed, our sins have been blotted out, and because there is no more need for His wrath. He can righteously declare that we too are righteous. 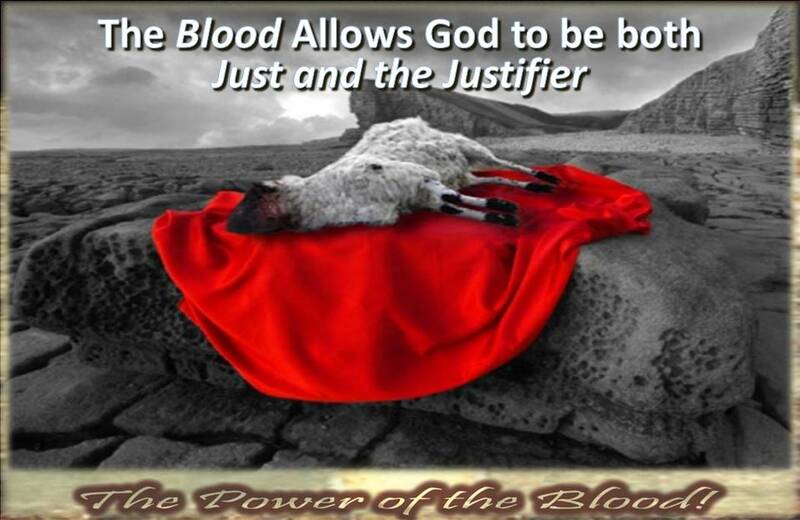 The blood enables the just to be the justifier! Know that God is Satisfied for He alone is Just! If God can accept the Blood as a payment for our sins and as the price of our redemption, then we can rest assured that the debt has been paid. If God is satisfied with the Blood, then the Blood must be acceptable. Only God has the right to say that the Blood is acceptable in His eyes and has fully satisfied Him. 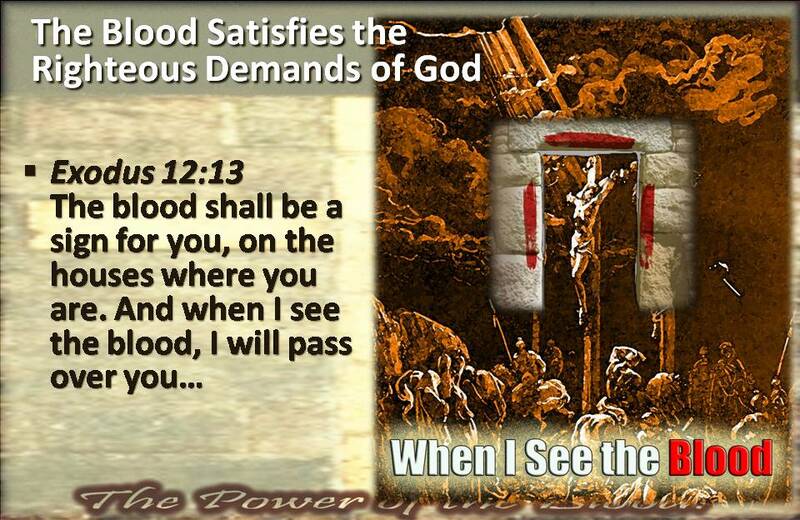 The Blood has satisfied God; it must satisfy us also. A. The Blood is Man-ward in the cleansing of our conscience. 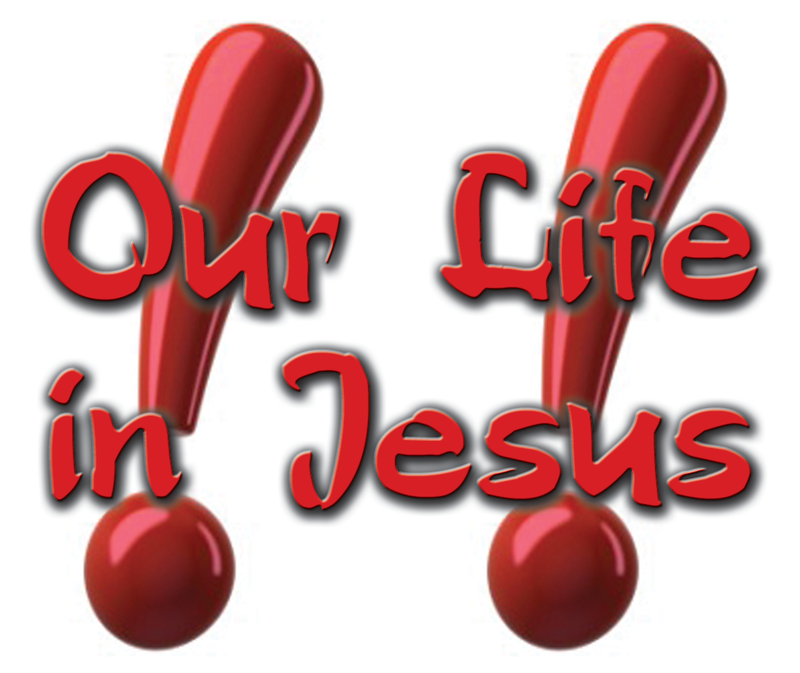 Ephesians 2:13 (ESV) But now in Christ Jesus you who once were far off have been brought near by the blood of Christ. Colossians 1:20 (ESV) and through him to reconcile to himself all things, whether on earth or in heaven, making peace by the blood of his cross. As Justified, we are “born again”, and God himself lives in us. We are “new creations” not merely improved versions. The Blood is the “sign” of our new relationship. 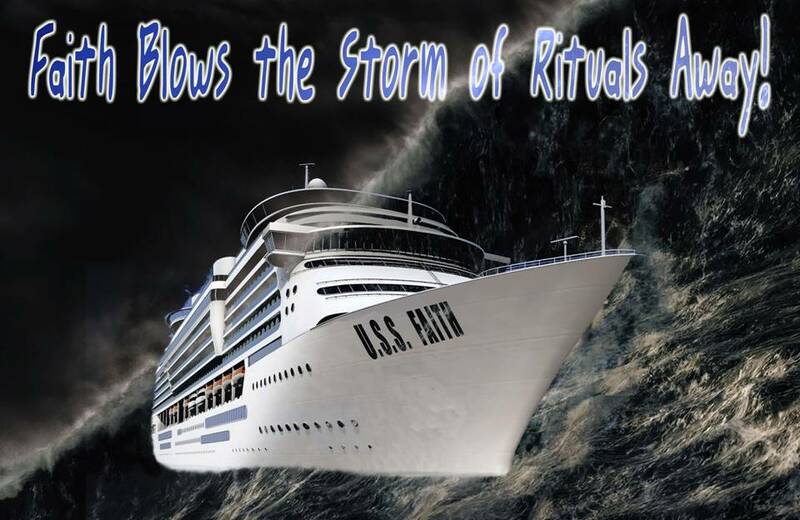 Exodus 12:13 (ESV) The blood shall be a sign (mark, as when Cain received a mark upon his forehead, also a beacon, standard) for you, on the houses where you are. And when I see the blood, I will pass over you, and no plague will befall you to destroy you, when I strike the land of Egypt. We are Redeemed from sin, We are forgiven for our sins, We are brought near to God, We are reconciled to God-all because of the Blood of Jesus Christ. 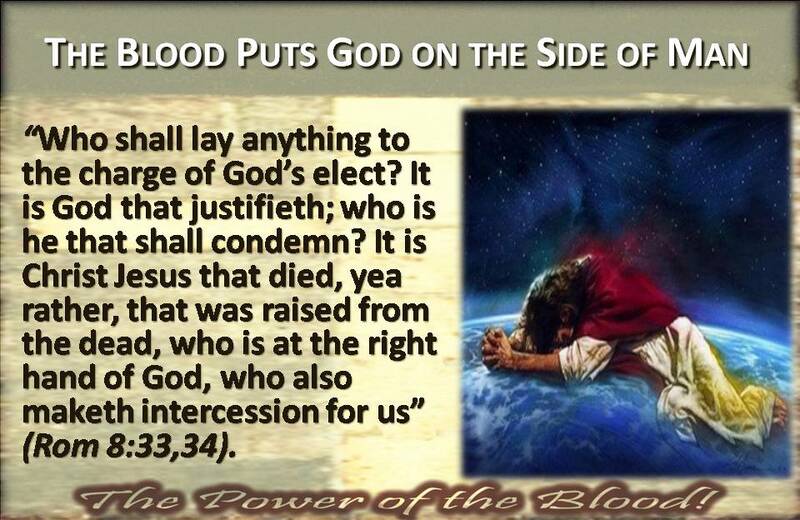 None of this would be possible if the Blood did not satisfy God’s Righteousness. B. 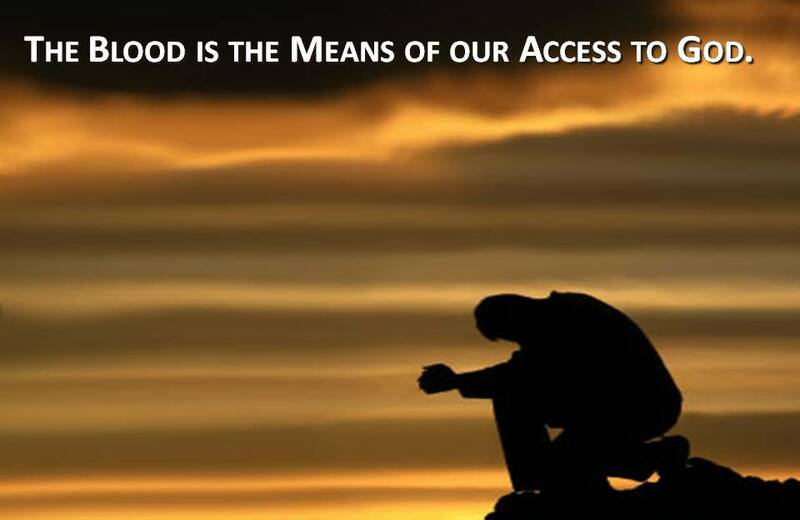 The Blood is the Means of our Access to God. We know that the Blood is the means of our forgiveness, but if we do not really see the value of the Blood, we will have difficulty approaching God. The reason is our ongoing sinfulness. God has a means of dealing with our sin nature as we will learn, but until that is done, our conscience will continue to accuse us and keep us from the sweet Joy of realizing how near we are to God’s presence. In fact, if we don’t understand the true power of Christ’s blood, we will live out our Christian lives as cold-hearted, fleshly-living, back-slidden children of God. 1. 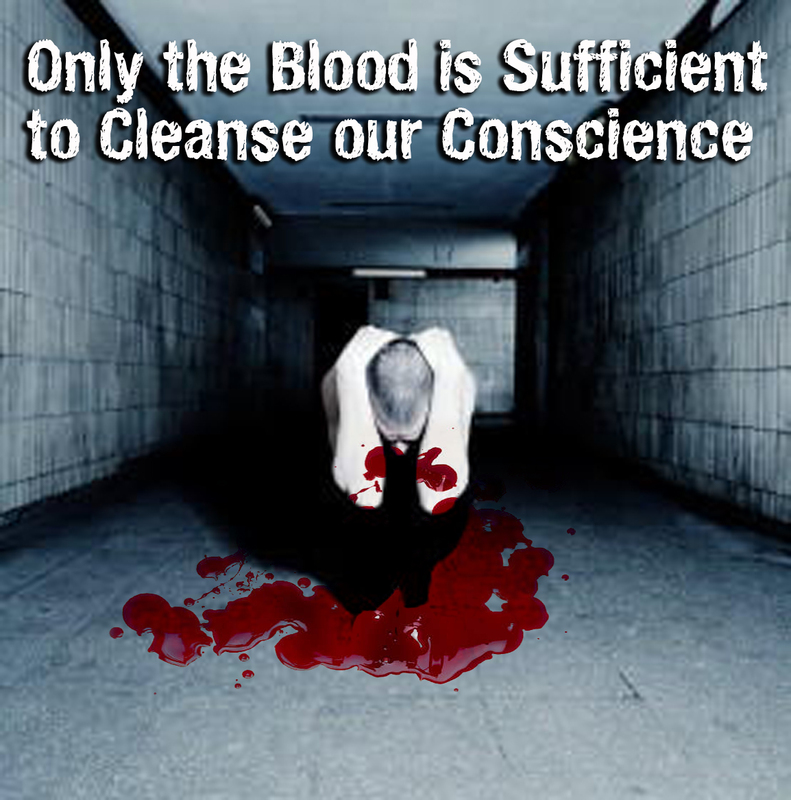 The Blood is Sufficient to Cleanse our Conscience. The blood of Christ is better than any drug that people take to “cope” with their failures! We are to have “hearts sprinkled from an evil conscience” (Hebrews 10:22). Hebrews 9:11-14 (ESV) But when Christ appeared as a high priest of the good things that have come, then through the greater and more perfect tent ( not made with hands, that is, not of this creation) he entered once for all into the holy places, not by means of the blood of goats and calves but by means of his own blood, thus securing an eternal redemption. 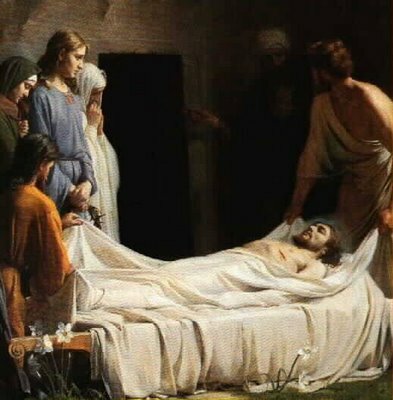 For if the blood of goats and bulls, and the sprinkling of defiled persons with the ashes of a heifer, sanctify for the purification of the flesh, how much more will the blood of Christ, who through the eternal Spirit offered himself without blemish to God, purify our conscience from dead works to serve the living God. Hebrews 10:19-23 (ESV) Therefore, brothers, since we have confidence to enter the holy places by the blood of Jesus, by the new and living way that he opened for us through the curtain, that is, through his flesh, and since we have a great priest over the house of God, let us draw near with a true heart in full assurance of faith, with our hearts sprinkled clean from an evil conscience and our bodies washed with pure water. Let us hold fast the confession of our hope without wavering, for he who promised is faithful. 2. Our sins cloud our Conscience and soul so that we believe there is a barrier between us and God. 3. 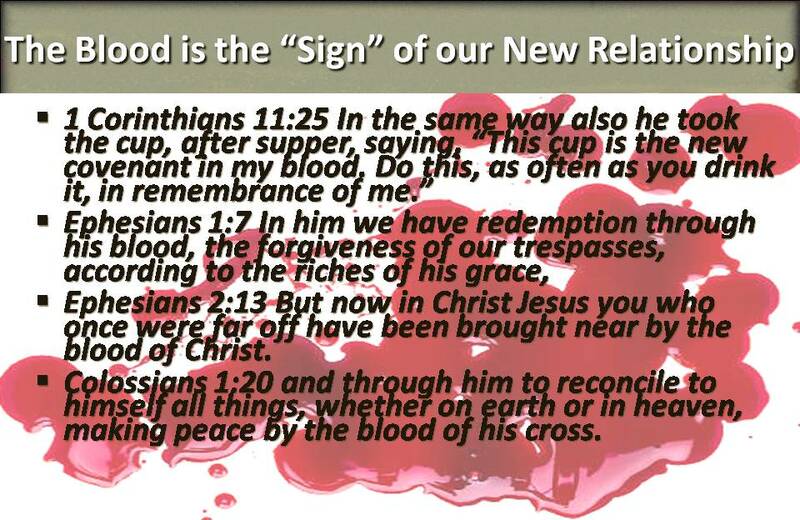 The Barrier has been removed by the intervention of the Blood of Christ. 5. God has made that fact known to me in His Word. 6. When that has been believed in and accepted, my conscience is at once cleared and my sense of guilt removed, and I have no more an evil conscience toward God. Faith and a clear conscience are interdependent. Your sins will cloud your faith, your ability to see God. 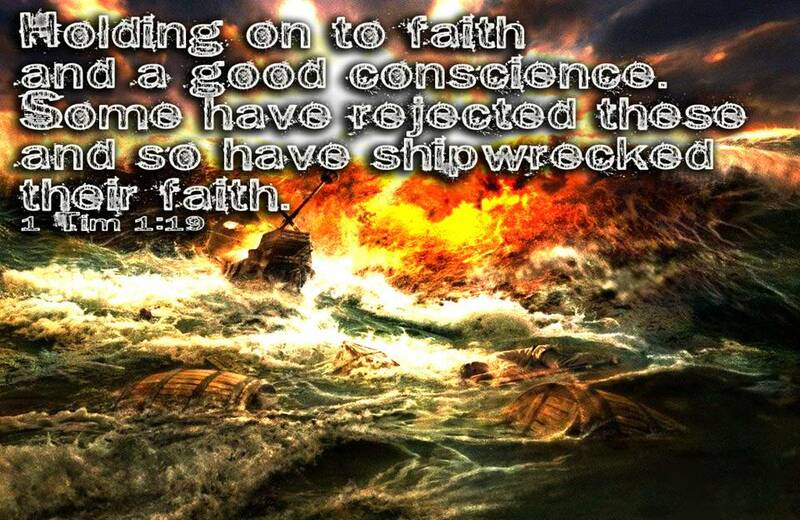 As soon as we find our conscience is uneasy our faith leaks away and immediately we find we cannot face God. 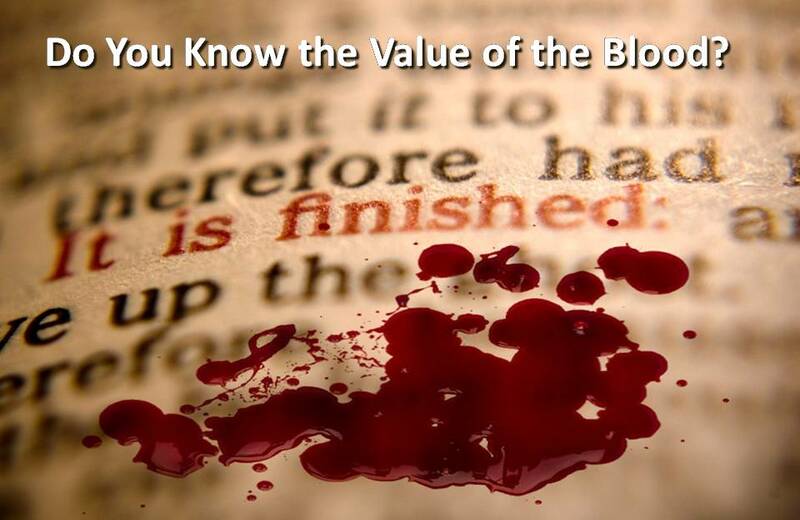 In order therefore to keep going on with God we must know the value of the Blood. God keeps short accounts, and we are made nigh by the Blood every day, every hour and every minute. It never loses its efficacy as our ground of access if we will but lay hold upon it. When we enter the most Holy Place, on what ground dare we enter but by the Blood? What is your basis of approach to God? Your Feelings or your Accomplishments? (which are up and down). The fact of the Blood of Jesus Christ, which alone satisfies God? (Which will never change). The Blood has never changed and never will. 2. Your approach to God is always in boldness. Ephesians 3:12 (ESV) in whom we have boldness and access with confidence through our faith in him. Boldness is yours through the Blood and never through your personal attainment. Whatever be your measure of attainment today or yesterday or the day before, as soon as you make a conscious move into the Most Holy Place, immediately you have to take your stand upon the safe and only ground of the shed Blood. Whether you have had a good day or a bad day, whether you have consciously sinned or not, your basis of approach is always the same—the Blood of Christ. That is the ground upon which you may enter, and there is no other. 3. Our Access to God has two phases, an initial and a progressive one. Our standing with God was secured by the Blood, for we are “made nigh in the blood of Christ” (Eph. 2:13). Our ground of continual access is still by the Blood, for the apostle exhorts us: “Having therefore… boldness to enter into the holy place by the blood of Jesus… let us draw near” (Heb. 10:19,22). To begin with I was made nigh by the Blood, and to continue in that new relationship I come through the Blood every time. D. No conscience can ever be clear apart from the Blood. 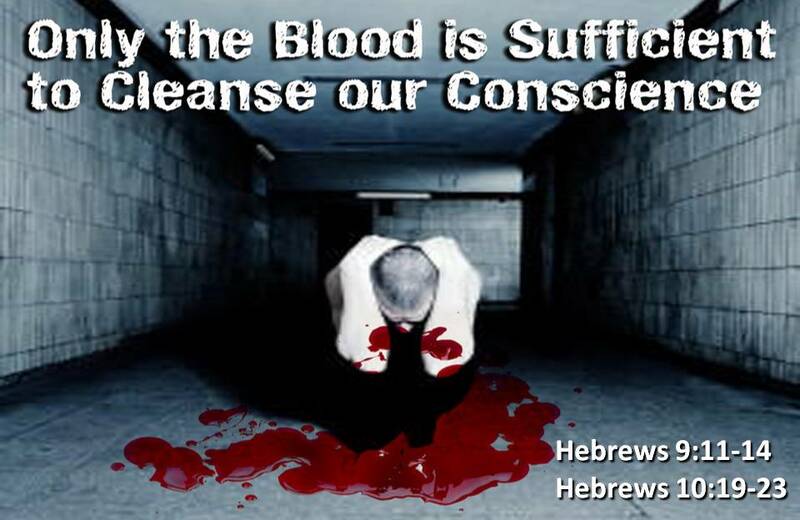 “No more conscience of sins”: these are tremendous words of Hebrews 10:2. We are cleansed from every sin; and we may truly echo the words of Paul:“Blessed is the man to whom the Lord will not reckon sin” (Romans 4:8). 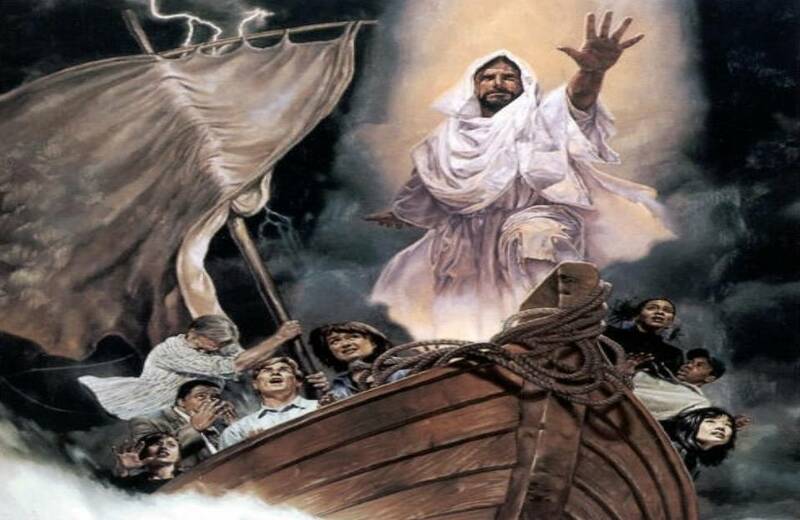 Revelation 12:10 (ESV) And I heard a loud voice in heaven, saying, “Now the salvation and the power and the kingdom of our God and the authority of his Christ have come, for the accuser of our brothers has been thrown down, who accuses them day and night before our God. 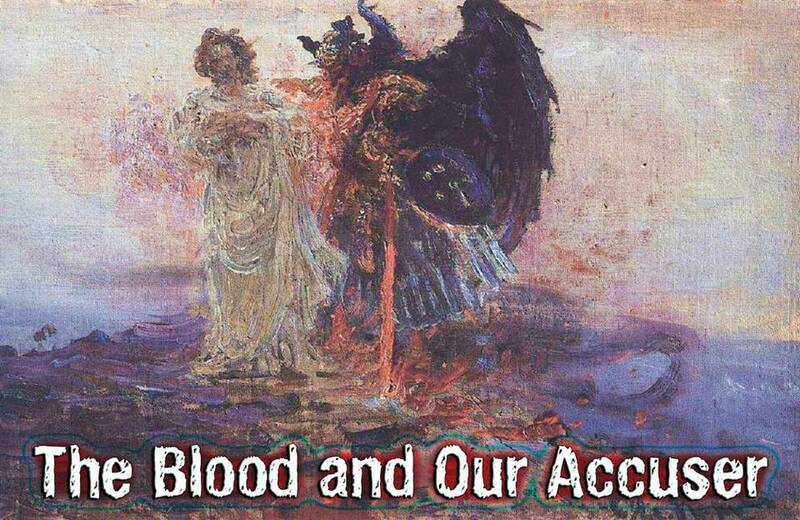 B. Jesus Christ Confronts Satan “through his own blood” (Hebrews 9:12). Hebrews 9:12 (ESV) he entered once for all into the holy places, not by means of the blood of goats and calves but by means of his own blood, thus securing an eternal redemption. Jesus Intercedes for us: Romans 8:34 (ESV) Who is to condemn? Christ Jesus is the one who died—more than that, who was raised— who is at the right hand of God, who indeed is interceding for us. Jesus is on Our Side! : Hebrews 7:25 (ESV) Consequently, he is able to save to the uttermost those who draw near to God through him, since he always lives to make intercession for them. C. The Blood Puts God on the Side of Man against Satan. The Fall brought something into man which gave Satan a footing within him, with the result that God was compelled to withdraw Himself. Man is now outside the garden—beyond reach of the glory of God (Romans 3:23)—because he is inwardly estranged from God. Because of what man has done, there is something in him which, until it is removed, renders God morally unable to defend him. But the Blood removes that barrier and restores man to God and God to man. 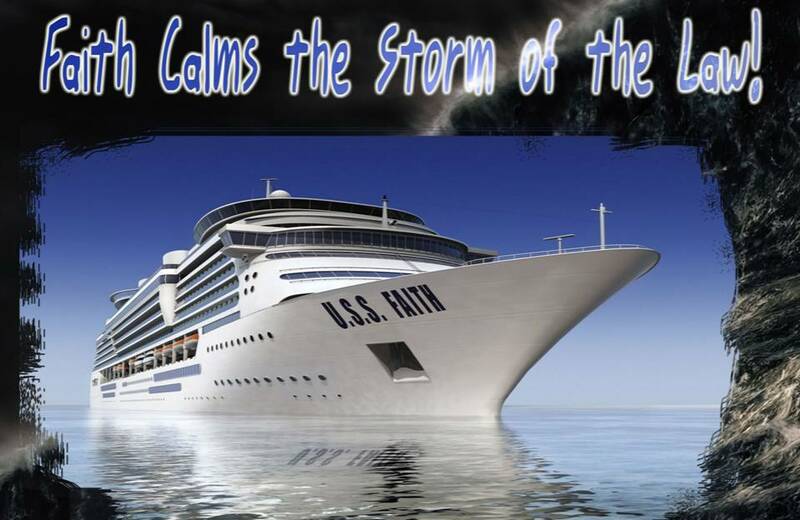 Man is in favor now, and because God is on his side he can face Satan without fear. God is the light, and as we walk in the light with Him everything is exposed and open to that light, so that God can see it all—and yet the Blood is able to cleanse from every sin. What a cleansing! It is not that I have not a profound knowledge of myself, nor that God has not a perfect knowledge of me. It is not that I try to hide something nor that God tries to overlook something. No, it is that He is in the light and I too am in the light, and that there the precious Blood cleanses me from every sin. The Blood is enough for that! In our human weakness, we think some sins are so great as to be unforgivable. Our conscience, even Satan continues to accuse us. God says every sin, big, little, becasue the Blood satisfies Him. Even though He sees them in His perfect light, He can forgive! 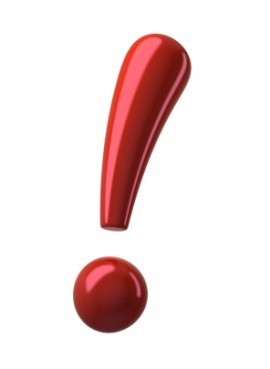 F. What Ground of Accusation Does Satan Have? Satan may accuse us before Him, but, “If God is for us, who is against us?” (Romans 8:31). God points him to the Blood of His dear Son. It is the answer against which Satan has no appeal. “Who shall lay anything to the charge of God’s elect? 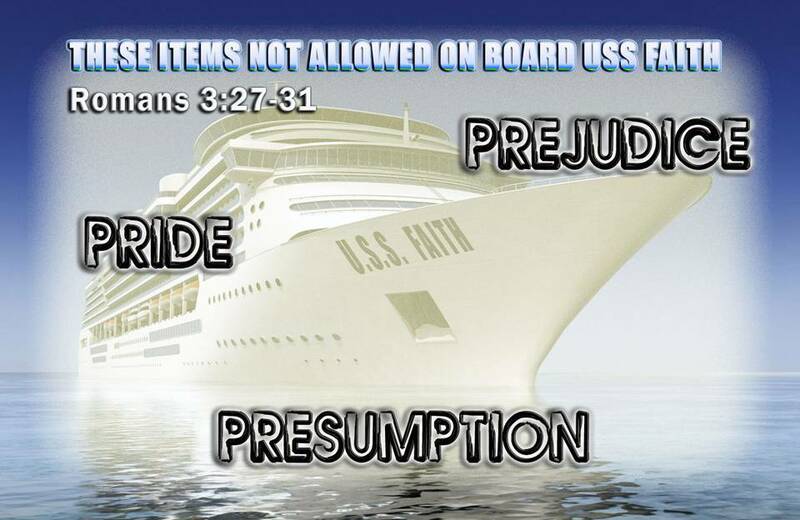 It is God that justifieth; who is he that shall condemn? 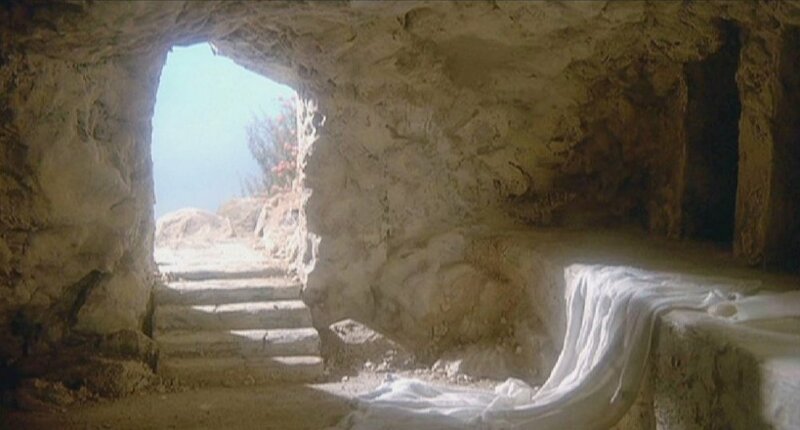 It is Christ Jesus that died, yea rather, that was raised from the dead, who is at the right hand of God, who also maketh intercession for us” (Romans 8:33,34). 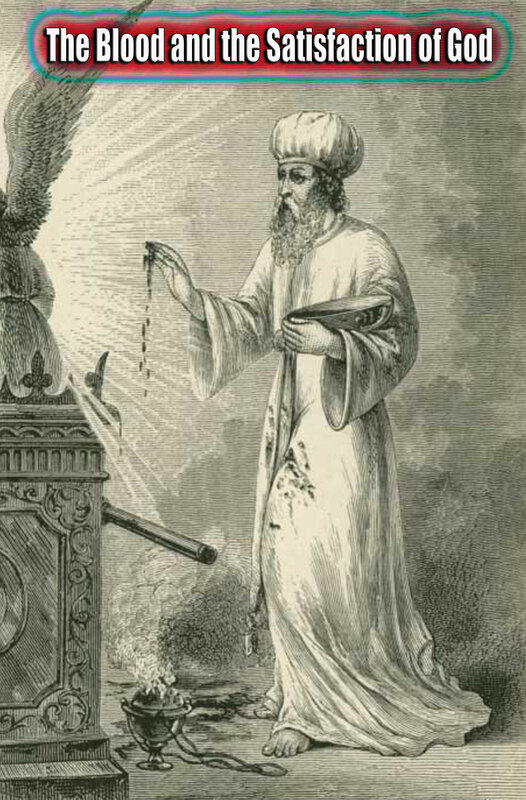 “Christ having come a high priest… through his own blood, entered in once for all into the holy place, having obtained eternal redemption” (Hebrews 9:11,12). He was Redeemer once. He has been High Priest and Advocate for nearly two thousand years. 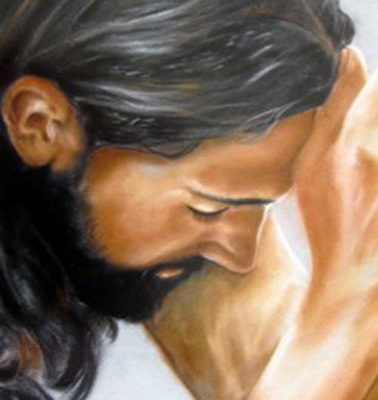 He stands there in the presence of God, and “he is the propitiation for our sins” (1 John 2:1,2). 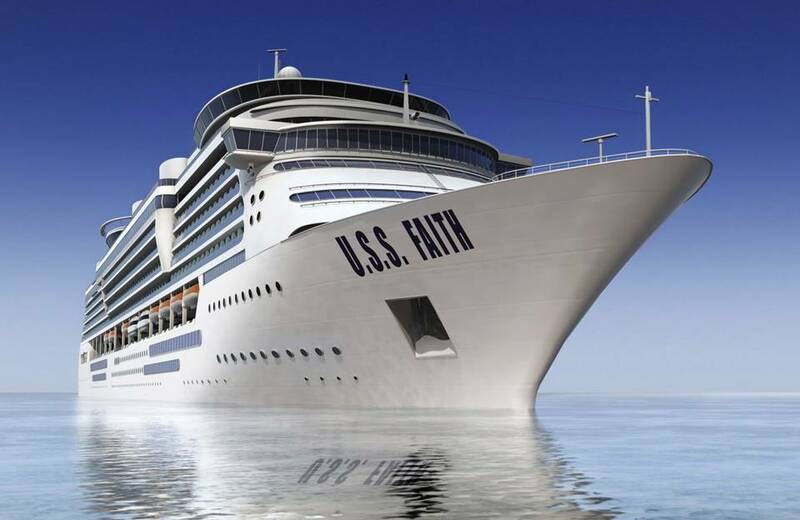 Hebrews 9:14: “How much more shall the blood of Christ…” They underline the sufficiency of His ministry. It is enough for God. What then of our attitude to Satan? This is important, for he accuses us not only before God but in our own conscience also. ‘You have sinned, and you keep on sinning. You are weak, and God can have nothing more to do with you.’ This is his argument. And our temptation is to look within and in self-defense to try to find in ourselves, in our feelings or our behavior, some ground for believing that Satan is wrong. Alternatively we are tempted to admit our helplessness and, going to the other extreme, to yield to depression and despair. Thus accusation becomes one of the greatest and most effective of Satan’s weapons. He points to our sins and seeks to charge us with them before God, and if we accept his accusations we go down immediately. Now the reason why we so readily accept his accusations is that we are still hoping to have some righteousness of our own. The ground of our expectation is wrong. Satan has succeeded in making us look in the wrong direction. Look to the BLOOD! Thereby he wins his point, rendering us ineffective. But if we have learned to put no confidence in the flesh, we shall not wonder if we sin, for the very nature of the flesh is to sin. 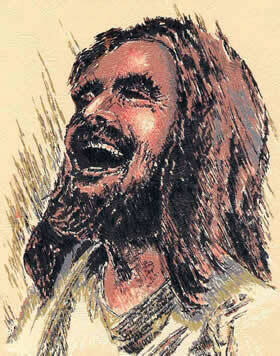 God cannot deal with a man under accusation, because such a man is not trusting in the Blood. The Blood speaks in his favor, but he is listening instead to Satan. Christ is our Advocate but we, the accused, side with the accuser. We have not recognized that it is God alone that can answer the accuser, and that in the precious Blood He has already done so. Our salvation lies in looking away to the Lord Jesus and in seeing that the Blood of the Lamb has met the whole situation created by our sins and has answered it. That is the sure foundation on which we stand. Never should we try to answer Satan with our good conduct but always with the Blood. 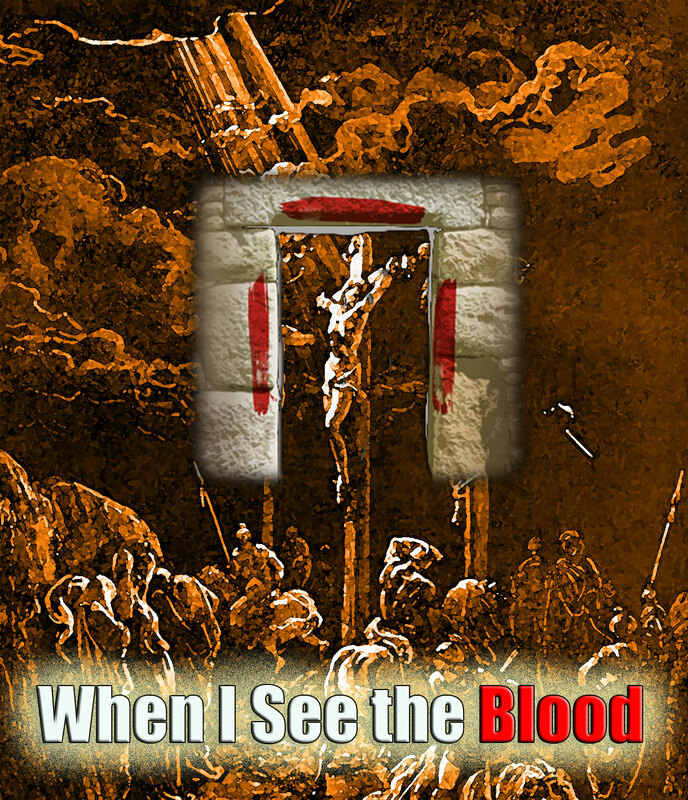 Oh, what an emancipation it would be if we saw more of the value of God’s eyes of the precious Blood of His dear Son! Do You See the Value of the Blood this Morning? If you do, it will affect the way you think, the way you pray, the way you serve. 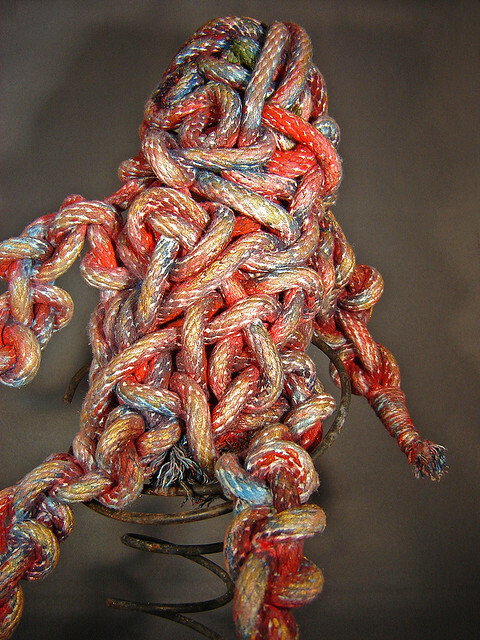 I once talked to a teenage girl who dad had an unusual way of disciplining her. She said he kept a stick handy. When she misbehaved to the point of needing discipline, he would get the stick. Her dad would tell her how much it hurt him for her to do wrong. He would then tell her that what she had done deserved to be punished. But he told her he couldn’t stand to punish her, so she would have to give him her punishment. So he gave the stick to her and then tell her how many times she was to strike him. I was concerned that that had left psychological scars on the little girl. Elder Brothers usually think they have things figured out. Even if things get tough they tend to hunker down and press on. Elder Brothers tend to see obstacles as big stepping stones. It might be big and obtrusive, but they’ll figure out a way to go around or even climb it if they have to. While David was a younger brother, when it came to Goliath, he acted like an Elder Brother. Goliath was just a big giant of an obstacle that could be brought down with a well-placed stone. Though the people sang his praises and Samuel anointed him with oil, David was not ready to lead his people. God required a man who was truly after His Heart. Saul had failed to obey. David showed the heart of a King, a man after God’s heart. But all Elder Brothers must learn something that David still needed to learn. God took David to a place that was so dark, it was impossible to see a way out or over or around. God took David to the deepest darkest cave, and in that cave David learned what every Elder Brother must learn. Isaiah 50:10 says ” He that walks in darkness, and hath no light, let him trust in the name of the Lord, and stay (lean) upon His God.” Most Elder Brothers in such a dire situation start to light their own fires as verse 11 indicates. And Elder Brothers who walk in the light of their own fires will lie down in torment as God’s Word says. David could have kindled his own fire, and Saul and his army would have discovered him and killed him. David did not ask God to rescue him, nor did he ask God to get rid of the obstacle. He simply said “God, I don’t want to see the obstacle except as you see it. I want you to be before my eyes”. David took his focus off the problem and placed it on God his Father. Then He simply said, “Be exalted O God, above the heavens”. 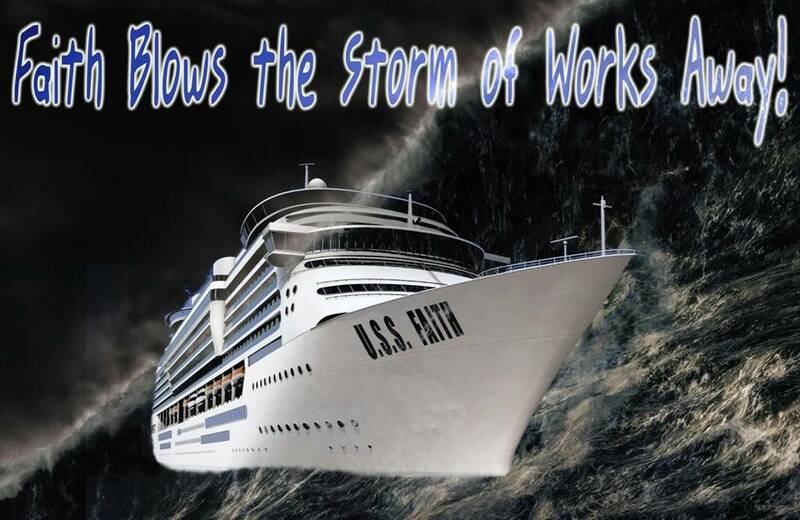 I don’t care how this situation works out as long as YOU O GOD are exalted through it! 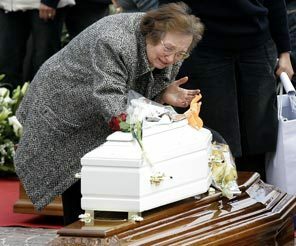 This is an Elder Brother after the heart of His Father! When your way gets dark, when obstacles are all around you; don’t be an Elder Brother who starts lighting your own fires to see what you can figure out. Be like David, and ask the Father to be exalted and take charge of the situation. 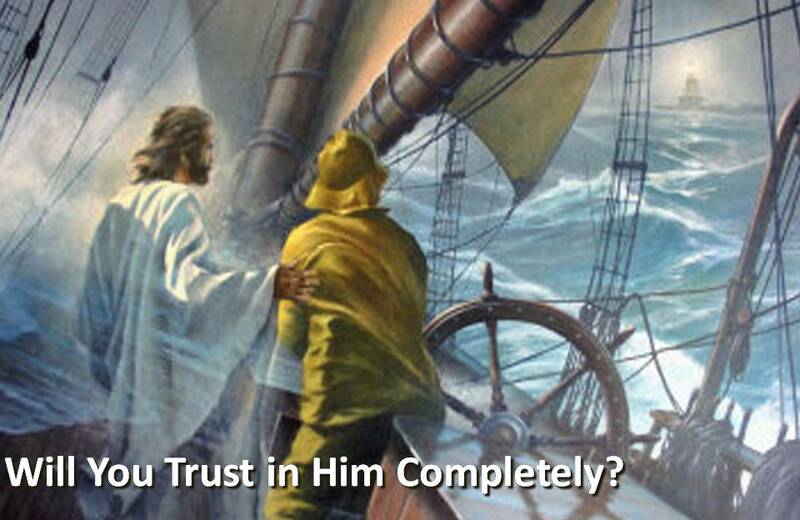 Trust in your Father, and lean upon Him! He will reveal His heart to you! Father: Be exalted in every situation I am facing. May I not react as a typical Elder Brother, but may I be a man after your Heart!